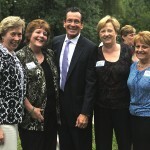 Governor Dannel Malloy, joined by State Rep Elaine O’Brien, met with over 100 residents at the Suffield DTC Summer Reception July 25. Governor Malloy addressed the crowd and pushed them to get out and vote to get Tom Frenaye, Democrat nominee for First Selectman, back in office. “Tom is your guy,” Malloy noted. He added that Tom has a long term vision; he knows how to lead and work with people. Tom can judge his success not by the battles he’s won, but by the battles he’s avoided, Malloy added. Frenaye spoke and noted that Suffield is a great town. “We need to build a long range plan with the community,” said Frenaye. Malloy also highlighted some of the accomplishments during his tenure including net job growth, developing Connecticut as a technology and innovation hub and making Bradley airport a major economic stimulus. Click here to see all our photos on our Facebook page.